This entry was posted in Baltimore Orioles, Baseball, University of Virginia and tagged Oakland A's, photography, Rain Delay by Jackie, The Baseball Bloggess. Bookmark the permalink. 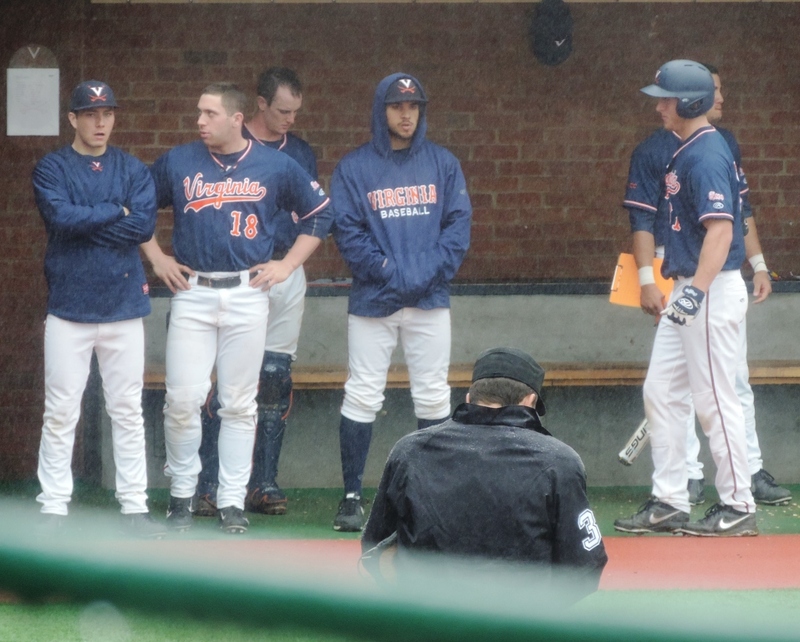 Here’s to UVa for braving the rain! And here’s to you guys for being willing to join them in their wetness! I thought the rain yesterday was miserable. 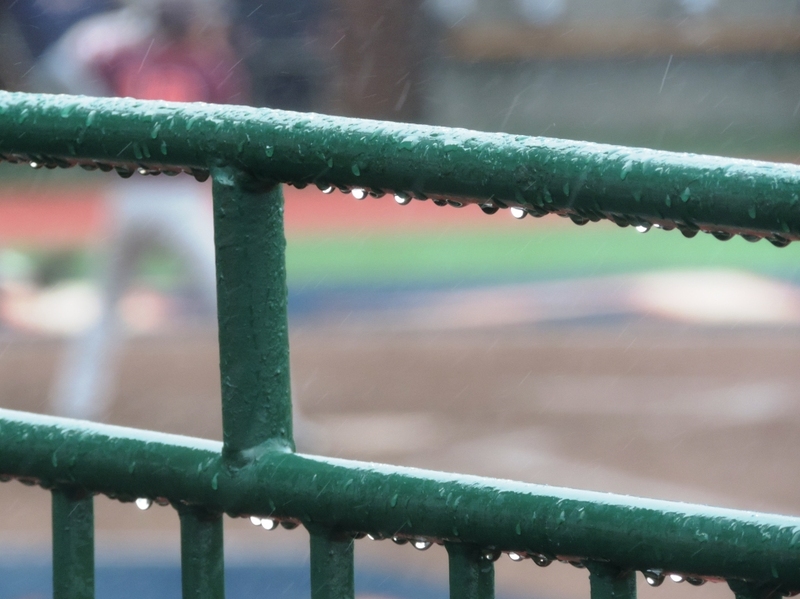 But, the rain and wind and cold and sleet at today’s game was so much worse … I may never thaw out! But, UVa wins again. Opening DAY. In my elementary school years, Major League Baseball was a DAYTIME job. The Fall Classic was during DAYTIME. My good friend treated me to the last season opener at Memorial Stadium, a humid 90-degree DAY game when the White Sox’ Sammy Sosa drove home five runs with two homers. The Os were bested 10-3. Still, despite seeing the Twins’ World Series success indoors, I’d rather see a baseball game– Legion, Independent League or Major League– start in the DAYLIGHT. Twilight and sunset can make for beautiful images at the ballpark, but I curse our use of electricity (not Benjamin Franklin’s discovery of it) for turning a game into a nighttime production of half-hour pre-game chit chat, several “arrangements” of the Star-Spangled Banner (being nice), and a game broken into half-innings by two-and-a-half minute breaks of commercials I grow tired of watching. Charlie Brown’s All-Stars didn’t play at night, didn’t play in a dome– though Lucy’s outfield play was ideal for the former Metrodome. What got me thinking even more about baseball in the daytime is what happened to Chicago Cubs in the NLCS in 2003, when a headphone-wearing Steve Bartman made an instinctive reaction to a foul ball that robbed Moises Alou of a catch, the reaction of which led to one of the most colossal chokes in sports history, for which Bartman was cruelly blamed for. Before Wrigley Field installed light towers, it was a treat to still be able to watch DAYTIME baseball on WGN, with Harry, Ryno, Sarge, The Penguin, Bull and the Cubbies. Our production director at WDAZ, a DIEHARD Cubbies fan, always had the game on the cable monitor or freed his schedule to be home to watch. 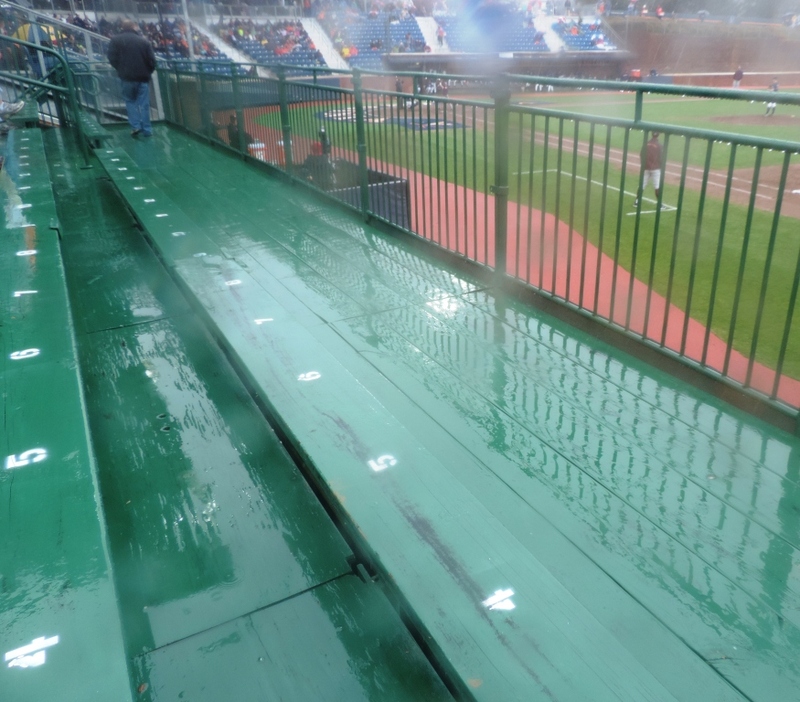 IF that 2003 game had been played in the DAYTIME, the customary winds off Lake Michigan could have possibly be a factor that would have spared Bartman or kept the Cub on their way to the PENNANT. Sure, no lights would have taken away the wonder of that closing sequence in the movie “Field of Dreams.” Opening night is for broadway premieres; OPENING DAY is for BASEBALL. Oh, that MLB would play all games until June in the DAYTIME, the next three months at night to avoid heatstroke, then back to the DAYTIME in October. Too much revenue would be lost. Shine on, baseball fans. OPENING DAY is our day, rain or shine. We’re born again. Here Comes The Sun. 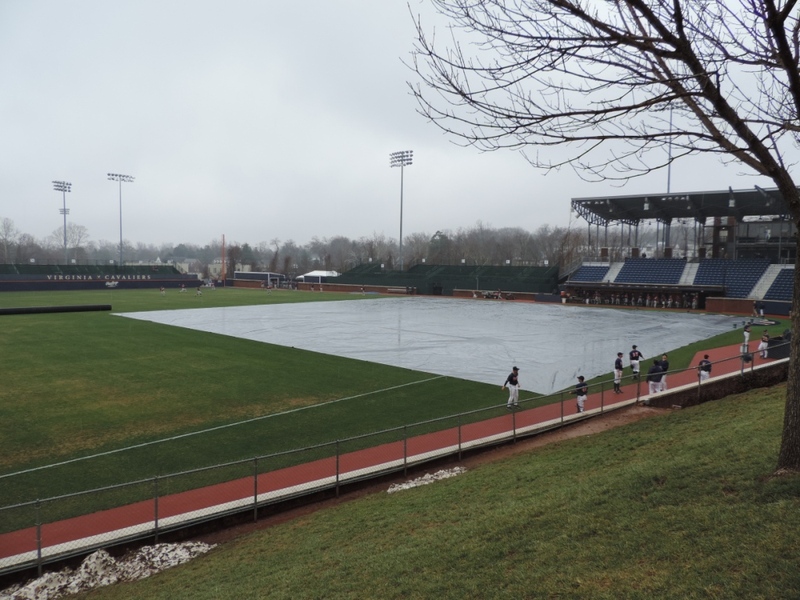 I was just thinking about that 90-degree Opening Day as the sleet started coming down on me in the middle of today’s UVa-Virginia Tech game! I’m still not thawed out. I agree with the history, tradition, and beauty of daytime baseball — and definitely for Opening Day — but I don’t know about going back to it fulltime for every game. Daytime baseball means it’s a game for the elite, the retired, or the unemployed. The workingman and workingladies can’t enjoy daytime baseball. I wish there were MORE daytime games, but not all daytime games. I think part of the reason my dad was a basketball and football fan — and not so much a baseball fan — was because of the daytime games, while he was at work. Sure, his bosses might take an afternoon to sneak off to see the Dodgers, (or, when we moved, the Giants), but not my dad. He had to stay and keep the office humming, while the bosses played hooky. No wonder, he didn’t care for it. Here’s my weekday plan for the next 7 months … go to work, come home, and eat dinner and watch the Orioles. Bliss, baby! It’s nt too late for you to jump on the Cardinals bandwagon. I think you’ll really enjoy watching some real baseball (i.e. not American League) as well as playoff baseball. It’s fun and exciting! I thought of you last week as I watched UVA playing Miami on TV. That’s a great team Virginia has. We have tickets to the Orioles / Cardinals series in August … it will be a nice preview of the World Series!